Labour MP Naz Shah in fresh outrage! Naz Shah is the 44 year old MP for Bradford West and is no stranger to controversy. With the anti-Jewish scandal currently engulfing the party she has previous form on this. She has shared messages on Social Media stating that Israel is no different from Apartheid South Africa and that Jews should be deported from Israel to the USA. She has been suspended in the past from the party and reinstated on numerous occassions. In one other highly dubious event her twitter account 'liked' a tweet that said victims of grooming gangs should just keep their mouths shut for the sake of diversity. Her latest social media gaffe has caused her to receive even greater criticism both from outside and within the Labour Party. ‘Necklacing’ was a sickening form of killing used by anti-apartheid actvists. It was used by black South Africans said to be working with the white minority government, including councillors, policemen, labourers working on white-owned farms and also female relatives. It involved binding the victim’s hands and sticking a tyre doused in petrol over their heads. This would then be set alight, resulting in a slow, agonising death. 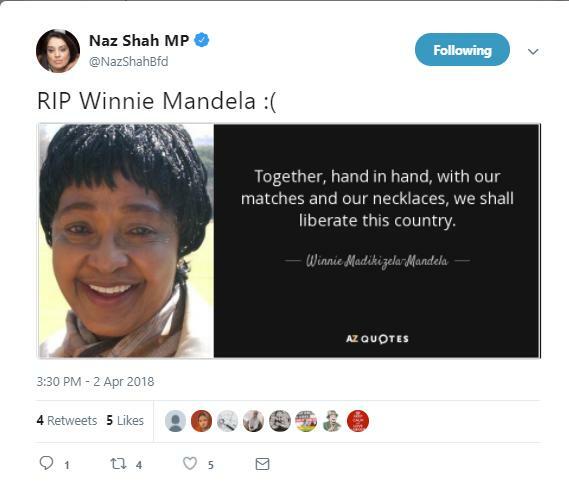 Shah has since deleted the tweet and apologised by saying she never knew what it meant. This either shows that Shah is of low intelligence or secretly she endorses these hardline extremist views but doesn't expect the public outcry. It is up to the public to decide which is true.